A two day National Conference on " Recent Advances in Experimental and Theoretical Physics (RAETP-2018)", scheduled for 17-18 April, 2018 organized by Department of Physics and Astronomical Sciences, Central University of Jammu commences today in the premises of the beautifully equipped campus of CU Jammu. This conference is sponsored by Council of Scientific & Industrial Research (CSIR), Govt. of India and Board of Research in Nuclear Sciences (BRNS) DAE, Govt. of India. Conference is inaugurated by Distinguished Prof. K. K. Aggarwal, (Chancellor, K.R. 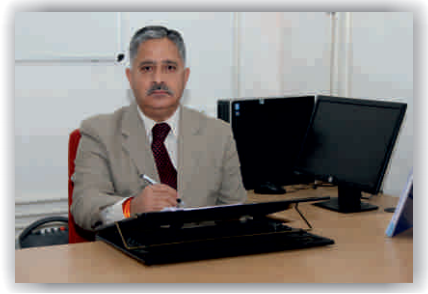 Mangalam University, Gurgaon, Haryana and Founder Vice-Chancellor, G.G.S.I. University, New Delhi). Prof. H.C. Swart (University of the Free State, South Africa), Hon’ble Vice-Chancellor, Prof Ashok Aima, also graced the inaugural ceremony with his august present. Other dignitaries, who graced the occasion, were Prof. R. P. Tandon, Special Guest of Honor, Nominee to Governor, J&K , Prof. Devanand, Dean School of Basic and Applied Sciences, CU Jammu, Prof Ravi Kumar (NIT, Hamirpur), Prof Mahavir Singh (HPU, Shimla) and Dr. Fouran Singh(IUAC, New Delhi). Chief Guest, Prof. Aggarwal deliberated on the importance of materials sciences and their applications in various field including medicine, space science, cosmetics, food etc. He mentioned significance of both theoretical and experimental physics for the development of society. In addition, Prof. Aggarwal encouraged the young researchers, participants and students to think out of box and find the multiple alternative solutions rather than their conventional one. He also appreciated the efforts of Organizing Committee of RAETP-2018 for making this a great technical event of the Central University of Jammu and in particular of Department of Physics and Astronomical Sciences. In his presidential address, Prof. Ashok Aima, HVC, CU Jammu emphasized that Conference of such nature provides a great opportunity for the scientific community, not only to update knowledge and keep abreast with the latest developments in the field of experimental and theoretical physics, but also an occasion for the invited speakers, delegates and participants to exchange ideas and interact with each other. He also said that this will act as channel for creating an atmosphere which will encourage and inspire students and young researchers for their overall academic growth. Dr. Vinay Kumar, Convener and HoD Physics and Astronomical Sciences, CU Jammu presented the welcome address to the gathering. He also informed that about 124 participants from all over India are participating in this conference. He apprised the audience that about 17 invited talks, 12 oral and 112 posters on various topics linked to experimental and theoretical Physics is expected to be presented during this two day conference. Prof. H. C. Swart presented a wonderful insight on the ‘Highly capable non-rare earth doped phosphor for light emitting diodes” in his keynote lecture. Prof. R. P. Tandon said that such useful discussions on recent advances in sciences will provide the platform to build inter disciplinary research to solve various Challenges in the world of Science and Technology. He complemented the organizers for their initiatives. Dr. Amit Tomar, organizing secretary of the Conference, summarized the event and presented the vote of thanks. He expressed his sincere gratitude for financial support rendered by sponsor, Toshvin Shimadzu, Agilent India, Ramesh Traders and Scientech India. He expressed his sincere thanks to Dr. Suram Singh, organizing secretary, Dr. Avinash C Yadav, co-convener, Dr. Jehova J L Hmar, Joint Secretary for their untiring efforts and support in organizing this conference.